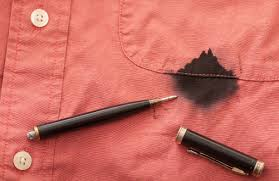 When trying to remove ink stains from clothing, make sure you consider the type of fabric you are dealing with. For example, you can use white vinegar on acrylic, nylon, polyester, etc. but it should not be used on cotton or linen. Cotton fabrics, nevertheless, can tolerate acetone nail polish remover. Soak the clothing in a quart of water mixed with one teaspoon of ammonia and a tablespoon of dishwashing detergent for half an hour. bleach and dab it on the affected area. Soaking the stained area in warm milk overnight or at least for 30 minutes may also be helpful. If these methods do not clean the stain, consider using a hairspray. The hairspray, however, may be damaging for certain fabrics.